My husband and son are both very much into cars. Riley can tell me the name of every vehicle as it passes by, including the model, at 7 years old..that's pretty smart! My husband has taught him most of this, from his love of cars, especially American cars. Both of them think the Dodge Challenger and Ford Mustang are the best cars ever made. So, this year, for their Birthdays, I wanted to get them something special that related to their love of cars. Riley was first, as I said, he has a love for Challengers, so I knew he would love this 1970 Dodge Challenger 426 HEMI® - 1:24 Scale. An M2 Ground Pounders 1:24 scale replica depicting HEMI's® 50th Anniversary is one for the ages. Add this HEMI® orange 1970 Dodge Challenger model to your already impressive collection of Mopar replicas. Spoiler on back, with decals on both front/rear windows and top of roof. 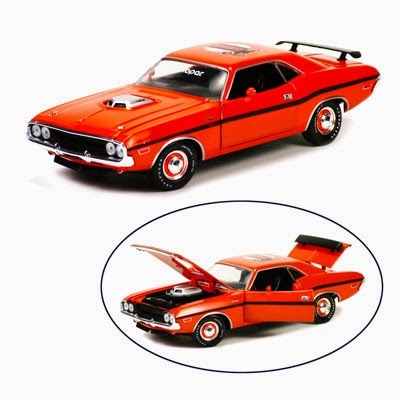 You can purchase the 1970 Dodge Challenger 426 HEMI® - 1:24 Scale at WearMopar for $32.95. For the HEMI-loving woman in your life, WearMopar also has many options for ladies wear. Ladies, this jacket will keep you warm in the colder season, all while showcasing the logo of the famous HEMI 426 engine. The classic "puffer" style jacket looks sharp and protects against the elements. A handy right chest pocket with black zip and a left arm pocket with black zip provide handy storage capability for items like cell phones, in addition to the lower side pockets that also feature black zips. A high collar protects against the chill winds of winter. Sizes: S-2XL. Available in Orange. I can't even begin to explain how soft this jacket is, it feels like its made of feathers, it is so soft and silky. The fact that it's fitted makes it look very stylish too! 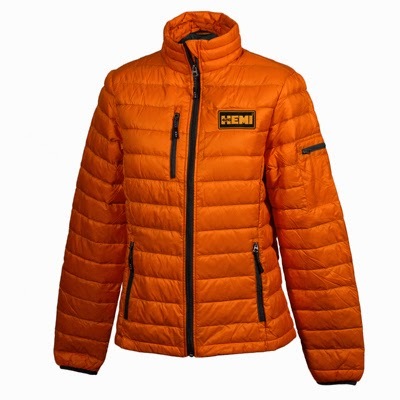 You can purchase the Ladies Hemi Puffer Jacket here for $119.00. I had no idea that Mopar sold Oakley Sunglasses! These sunglasses go great with the jacket, and with the name of Oakley's I know they will be loved. These Oakley® Mopar ladies sunglasses were invented with a Three-Point Fit, and you'll appreciate how it eliminates pressure points and takes comfort to the max. All lenses are made of optically pure Plutonite® that stops UV in its tracks to help protect your eyes and the delicate skin around them. The side view shows off the metal band and chic icon accents, not to mention the thin profile of this comfortably lightweight O Matter® frame, as well as ear and nose pads that maintain a sure grip to keep up with your never-slow-down lifestyle. Feel free to let "active and attractive" define you. Polarized lens. Available in Polished Black. You can purchase these Oakley® Mopar ladies sunglasses here for $129.00.